The federal government is more than halfway through its fiscal 2013 sequester, and the first round of automatic cuts, scheduled to last seven months, have reached a high-point. Agencies have reduced rental assistance for thousands of rural, low-income residents, emergency unemployment benefits have been trimmed, and hundreds of thousands of federal workers are being furloughed — although some of the projected impacts haven’t materialized. When it comes to the sequester, furlough days are a unique burden for the federal workforce. Some agencies have managed to eliminate the threat, but Defense workers aren’t so fortunate. Initially faced with the threat of 22 days of unpaid leave, 650,000 Defense civilian staffers face 11 days off, or a 20 percent pay cut between now and the end of the fiscal year in September. Federal employees protest the sequester outside the Department of Labor on March 20. (Andrew Harrer/Bloomberg). We’ve heard from some government workers about their frustrations and strategies for dealing with the cuts, and we’d like to hear more. Are you working alongside a contractor who doesn’t have to deal with furloughs? Or are you a contractor who may lose a job? 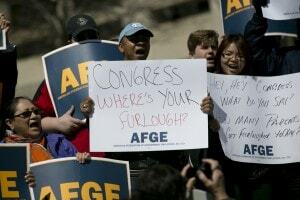 Post your Furloughed File or email your story to federalworker@washpost.com. How are you cutting expenses? Do you have a parttime job or are you looking for one? What about morale? Are folks taking additional furlough days to help colleagues facing severe hardship? decided not to stress? What do the furloughs mean to government services in your agency? To military preparedness or other issues? Maybe you’re planning your days around holidays and trying to make the best of it all? Or maybe you’ve canceled vacation altogether. We’ll run your commentaries for as long as they flow between now and September. We know for many it’s going to be a long summer.